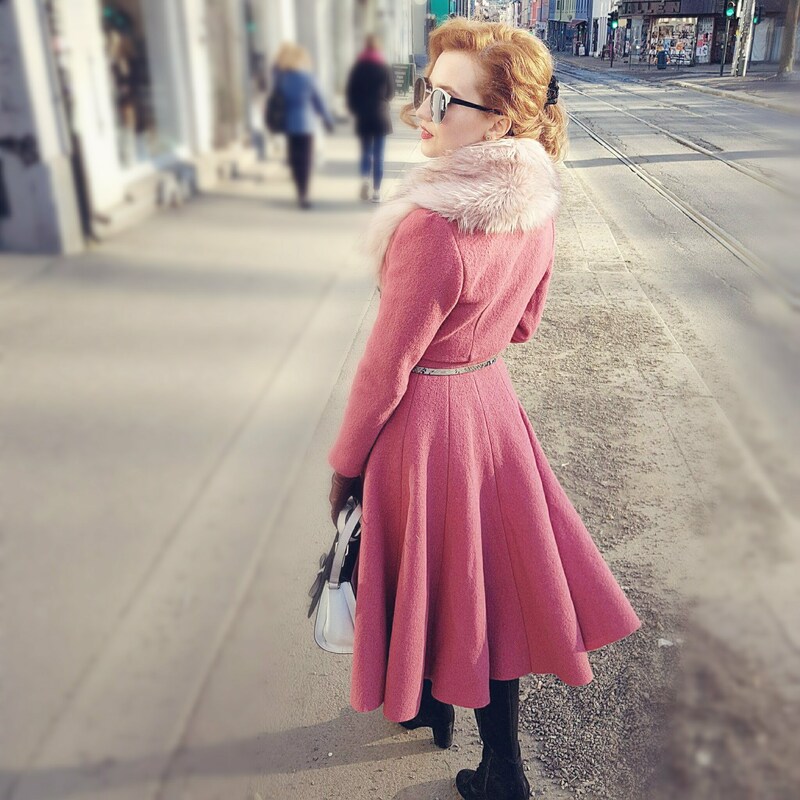 The winter in Norway still holds us in its tight grip, which in turn makes me hold tight to my woolen coat. 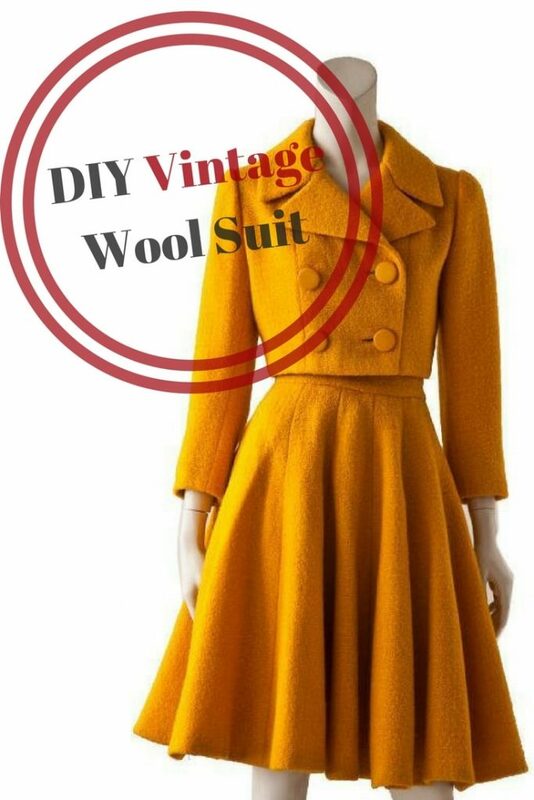 Which is why I am so excited to show you how to make two piece Norman Norell-Inspired Vintage Wool Suit!!! I bought thick wool in a lovely color (raspberry milkshake!) that’s sure to keep me warm. Feel free to use a lighter material if you live in a warmer climate. This material also has the advantage of not fraying, so it was a pleasure to work with it. 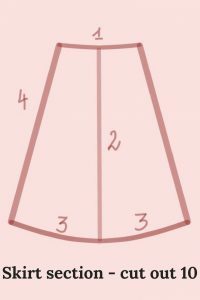 This is part one of the tutorial for the suit where I will show you how to make a beautiful, flared skirt. If you click here you will find the tutorial for the jacket. This skirt is actually extremely easy to make. 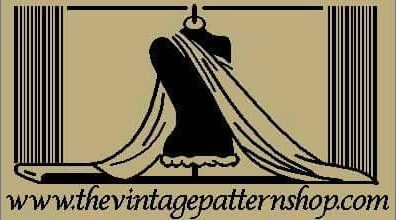 First, you must draft two pattern pieces. Yes, two! 😀 Nothing more! The waistband is a rectangular shaped pattern piece. 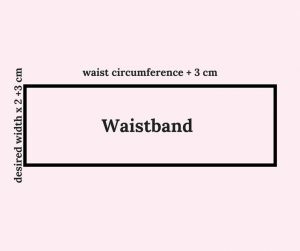 The length of the waistband is your waist circumference plus 3 cm for seam allowance. The width of the waistband depends on how wide you want your waistband to be. My waistband is supposed to be 3 cm wide, so the width of my pattern piece is 3 cm x2 + 3 cm = 9 cm. Next, you will draft the skirt pattern piece. On the picture of the suit, I counted that the skirt consists of 10 pieces sewn together. I am not sure if they are all exactly the same in the original skirt, but I drafted only one pattern piece and cut out 10 skirt panels out of it and it worked just fine. 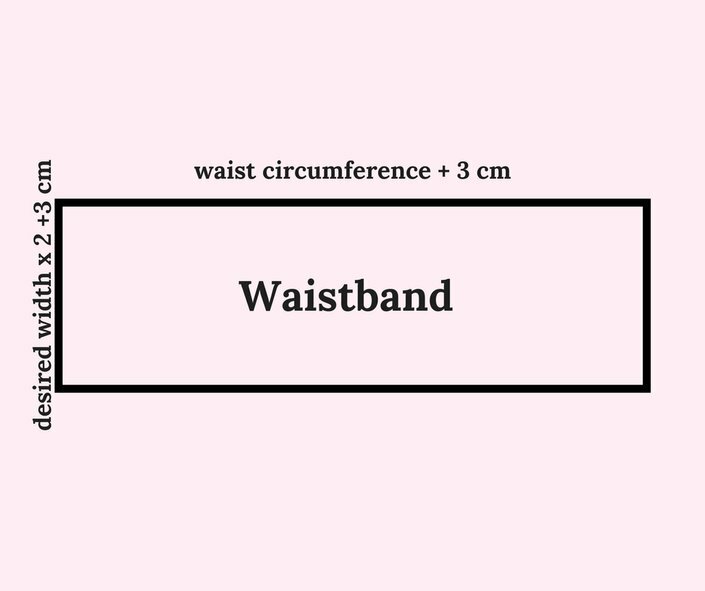 Divide your waist measurement by 10 and add 3 cm to the number you received. This is the top of your pattern. Next, decide on the length of your skirt. 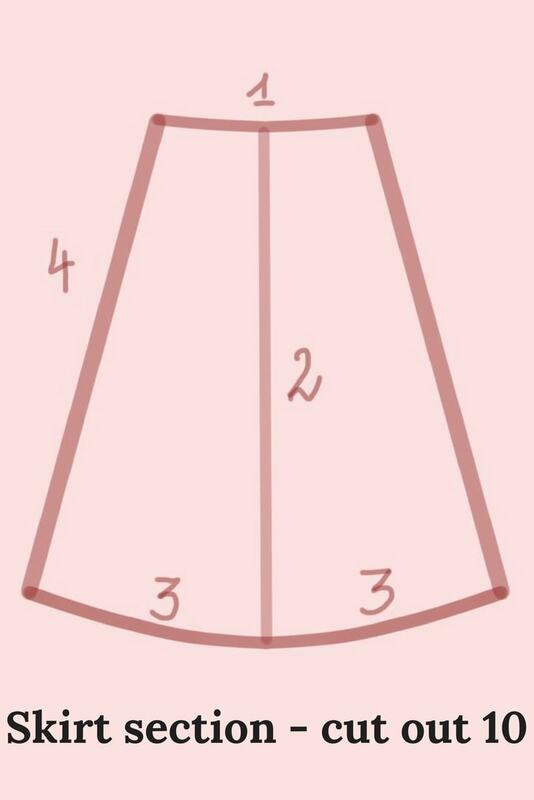 Measure the distance from your waist to the point on your legs where you want the skirt to end. On a piece of pattern making paper draw the upper line of the skirt. Make a mark in the middle and from that mark, draw the line downwards to mark the length. The skirt needs to flare out a bit. I chose to extend the bottom part of the pattern 10 cm on each side and slightly curve the bottom hem. 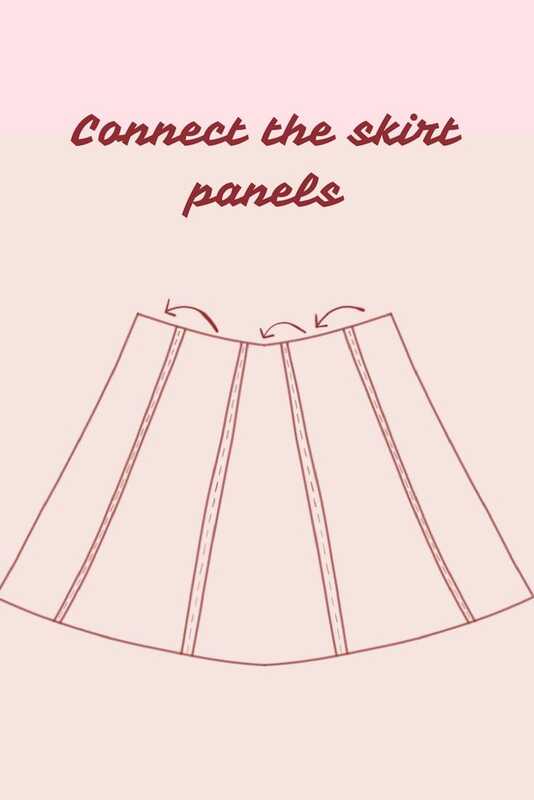 Lastly, connect the bottom of the skirt to the top with a straight line. Cut out 10 skirt pieces. Start by putting two skirt panels right sides together and stitching it along one side. Now you have two connected panels. Iron the seam open. 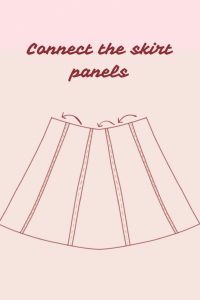 Next, take another skirt panel, put it right sides together with one of the panels that you have just sewn together and stitch along one side. Open and iron the seam flat. You will keep repeating the process until you run out of skirt panels and two panels on each side are not sewn together yet. 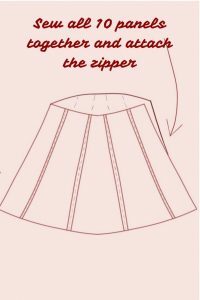 Put the skirt panels from opposite ends of the skirt right sides together, pin and stitch, stopping at around 10 cm before you reach the top, to leave space for the zipper. 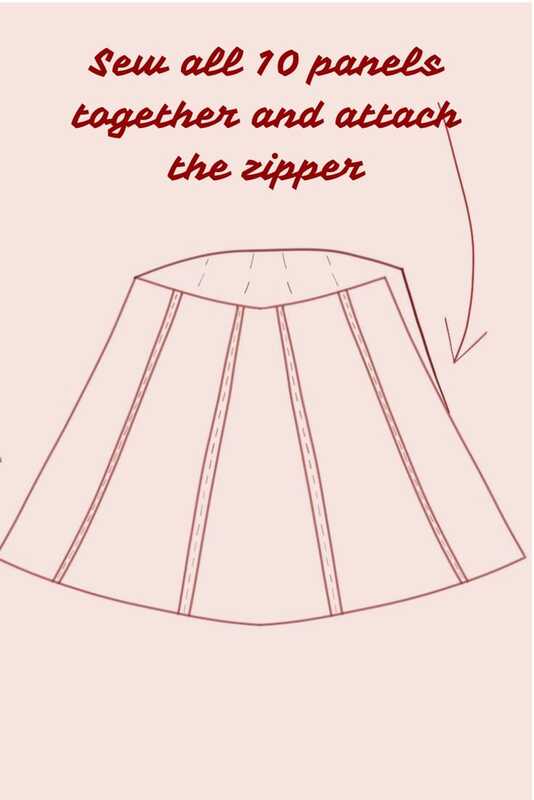 Follow these instructions to install the invisible zipper on the side of your skirt. Next, fold the waistband in two and iron it to keep the shape. Open the waistband and turn up the seam allowance on one side (1,5 cm), iron it to help it stay in place. Start pinning the waistband to the top of the skirt, right sides together. Leave 1,5 cm out on each side. Pin the side without the upturned seam allowance. Sew the waistband to the skirt. Next, iron the seams up towards the waistband and grade the seam allowances. Fold the waistband right sides together and sew along the edges. Flip the waistband to the right side and start attaching the waistband (along the edge with upturned seam allowance) to the back of the skirt. Stitch in place using stitch in the ditch. Turn your hem up, iron and pin in place. Then hem the skirt by using a blind stitch. Ta da!! You are done! What do you think about this skirt tutorial? 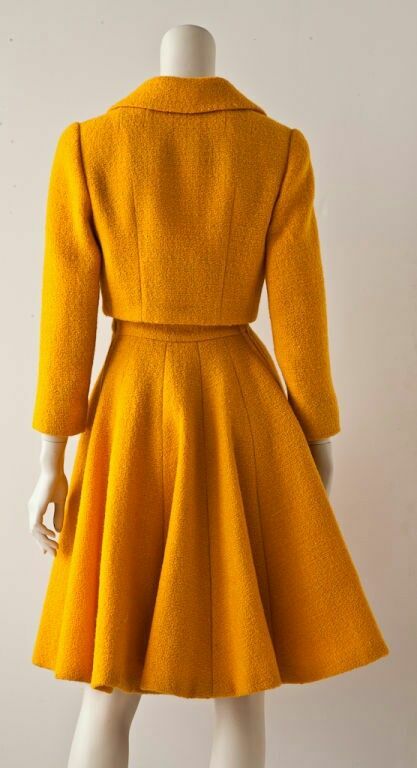 Would you like to make your own Norman Norell-Inspired Vintage Wool Suit for the cold winter days? Here is a picture of how my skirt turned out and I promise to take a better one once I make the jacket! 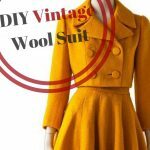 Are you looking forward to a tutorial for a jacket to match your lovely skirt? I’m so excited to learn how to make the jacket! Thank you for your comment. I will try to publish the instructions for the jacket in the upcoming days. To be honest, the jacket was the main part that motivated me to start this project. It’s beautiful, isn’t it?! Hello, I loved your page. I hope you can continue uploading more tutorials, since I follow you on all your social networks. I would like you to be able to upload the tutorial of the jacket of this set, love it from the first moment I saw it. Thank you, you are a master. (excuse my English, I only speak Spanish). Beautiful suit…. Winter is approaching in Cape Town and this will be perfect! How many yards of fabric did you need to make your skirt? It depends on your size and the width of the fabric you choose. I always prefer to be on the safe side and buy a little more fabric than I think necessary. I would say that 3 to 3,5 yards should be enough. When I am not sure how much fabric to buy, I lay the pattern pieces on the floor to help me gauge how much fabric is needed. I hope that was a bit helpful! Just Love This Site.! 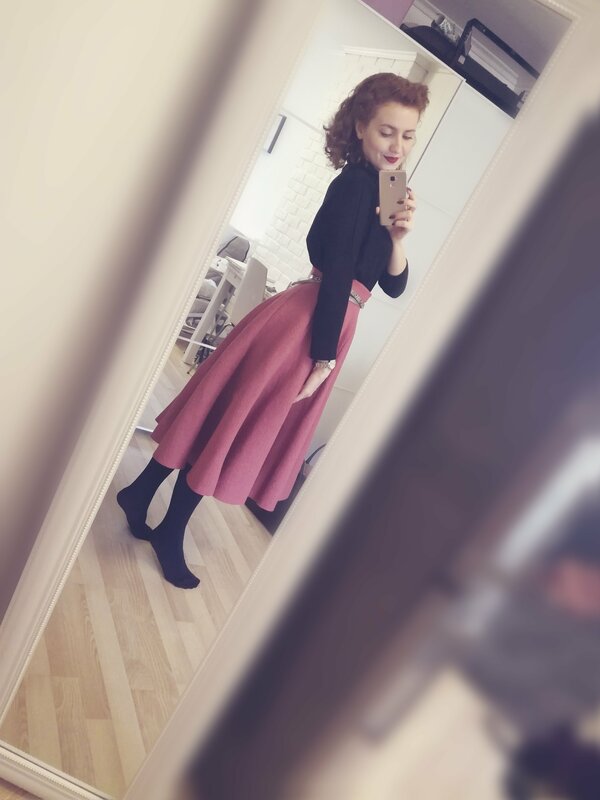 I’ve fallen in love with 50’s women’s fashions too!